12/6/12 - Acquisition - Paris, Musée du Louvre - The Louvre pre-empted a Bouchardon bust during the Aguttes auction at the Hôtel Drouot yesterday. Estimated at 3.5 to 4 million euros, this portrait of Charles-Frédéric de la Tour du Pin, Marquis du Gouvernet, which had remained in the family until now, sold for 3,750,000 euros. Not much is known about the life of the Marquis except that he was governor of Montélimar ; he commissioned this bust from the artist in 1734 and received it in 1736 after which it was exhibited at the Salon in 1738. A terracotta version resides at the Musée Jacquemart-André, while another one, in plaster, is mentioned in the archives but its whereabouts are unknown. This works offers a very beautiful example of a portrait "à l’antique", developed by Bouchardon, who resided at the Académie de France in Rome from 1723 to 1732. It reveals the sculptor’s boldness, introducing the classical ideal at a time when the art of Adam or Slodtz were in full Baroque. Edme Bouchardon, who knew "how to appropriate the talent of the Ancients and then find it in Nature", as the Comte de Caylus explained, gives his model the appearance of an antique hero, unclothed, while treating the hair, free flowing, with great naturalism and finally, chose to turn the face slightly in profile, instead of aligning it with the torso, in order to enliven the composition. 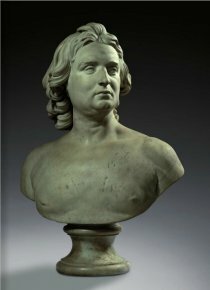 Working in the same spirit, the sculptor had produced a bust of Baron Philipp von Stosch in 1727, inspiring himself in Trajan’s likeness (Capitoline Museum in Rome), then that of John Gordon (Inverness Museum and Art Gallery) in 1728, and finally the portrait of Lord Hervey (Melbury House) in 1729. Besides Bouchardon’s famous mythological sculptures, the Louvre holds another bust by this artist, that of Madame Vleughels, the wife of the director of the Académie de France in Rome, sculpted in 1732. We are pleased to learn of this acquisition, echoing Claude Aguttes who asked the public to applaud the museum’s initiative at the auction.